When I introduce Agile in a company, I’ll confront the employees with change. I’ll teach them to imagine the result of the outcome to overcome fears of change. This post with the story of Cliff Young is about what I tell them. … ever be able to increase their productivity? … get rid of their technical debt? The goal is beyond their imagination. Their constraints seem to be too narrow for them from their point of view. They are afraid of failing, so they don’t start changing. And indeed, why should they? Runners know that they have to be able to imagine crossing the finish line to finish a race. A runner can despair of the whole race without having the faith in his success. People confronted with change often fear change because they can’t imagine their success, or at least that they are able to make a difference. People have fear of change, so they don’t start change. One reason for the fear of change is that the result of change is unimaginable to these people. Then I tell them the story of Cliff Young. Cliff Young won the very first Westfield Sydney to Melbourne Ultra Marathon in 1983. This race went from Westfield Parramatta, in Sydney, and Westfield Doncaster, in Melbourne, Australia’s then two largest shopping centres. The course stretched over 875 kilometres (544 miles). Before this event, runners needed almost 8 days for races of the distance of the Westfield Sydney to Melbourne Ultra Marathon. Cliff Young didn’t. He established a new record, and it took him only 5 days, 15 hours, 4 minutes to do so. He improved the record by more than 2 days. Only 7 people had the strength to finish this race, and every one of them was faster than the previous record on distances like that. Cliff Young defeated all of them. He was almost one day faster than the second finisher. So far, so okay, you’d say. A story of a Lance Armstrong like super human, a Michael Jordan of the ultra marathons, a Michael Schumacher of the long distances. Nope, Cliff Young was different. 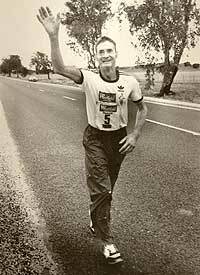 Cliff Young was 61 years old, twice the age of his competitors, when he won the Westfield Sydney to Melbourne Ultra Marathon. He was a potato farmer and was brought up on a farm with 2000 sheeps on 2000 acres of land. He arrived at the race in an overall and gumboots, because he thought they might come in handy considering the upcoming rain. When runners attend a race with such a brutal distance, they gathered lots of experience in other races with smaller distances before, they are backed up by sponsores like Nike, and they train for months before the race. Cliff Young never finished a race before, had no coach and hadn’t trained for this special event. When he was asked by reporters, why he thought he was prepared for this race, he told them that he had lots of experience to round up his sheep, which could take him two to three days. It’s amazing how a 61-year-old, gumboot-wearing, unexperienced guy like Cliff Young could outrun one of the best long distance runners in the world and set a new record. But what’s even more amazing is how he did it. On a multi day race like the Westfield Sydney to Melbourne Ultra Marathon runners usually have to manage their powers very carefully. They ran 18 hours a day, followed by a break of 6 hours of sleep. But nobody told Cliff Young to do so. Cliff Young started his race very slowly and was soon the last runner in the field. His movement wasn’t even considered as running, it was more of a shuffling. But when all the other runners went to sleep in the first night, Cliff Young continued shuffling. He shuffled all night long, and never went to sleep like the other runners did. Look at the Young-Shuffle – with gumboots! With that tortoise-and-hare strategy, Cliff Young outran every one of his competitors. His running style later was called the Young-Shuffle. It was considered to be efficient and less energy-draining than previous running styles. Three of the Westfield Sydney to Melbourne Ultra Marathon winners of the following years used the Young-Shuffle. Cliff Young won, because he didn’t know that he wasn’t supposed to. He didn’t know that he should have constraints preventing his success. He imagined that he would be able to run this race successfully, because he knew he could run after his sheep for days. … to raise productivity: Agile brings dozens of tools and methods to you to do so. There are lots of other (and very successful) companies out there who use those tools and methods, so maybe you’ll give them a try. … to ship more often: With Agile tools and methods companies are able to ship multiple times a day (Yahoo, Facebook, Google, only to name a few and most successful ones), and they use Agile methods and tools. You won’t get there in a short time if you start from a release per year, and you’ll never get there if you don’t start change. … to get rid of technical debt: Again, with Agile tools and methods you have the power to prevent technical debt in the first place, and there are a few very strong strategies to get rid of existing technical debt as well. Ask yourself if you have at least tried one of them to actually see their impact on your own technical debt. When facing change, just forget that you can fail. Imagine your success and give it a try. This entry was posted in General and tagged agile pilot, change, it-agile-blog-planet. Bookmark the permalink. I enjoyed your story especially given Cliff Young’s age. I am 74. I have never done interactive media before. Now I feel illiterate because I cannot express myself in the new mediums of the day. I am told Maya is the software to learn. I have looked into it and the literature says it is not for beginners, and it is very expensive. Since you are in software may I ask you advice on how to proceed. I do intend to persevere. I’m glad you liked the post. Great to hear that you’re still eager to learn! I’m sorry, but I can’t help you with advice regarding Maya. Although I’m in software, I’ve never done 3D animations. I wish you all the best and hope that you’ll find what you’re looking for!